Some amateur fighters have a professional style possibly due to so much sparring with professionals. This is the case many times in Philadelphia. In doing an interview with former IBF heavyweight champion Chris Byrd who sparred with Hanks he said “Joe Hanks is probably the best young American boxer out there”. To that Hanks said “I wish Chris would stop putting that out there for I have problems getting opponents,” laughed Hanks. Not having seen Hanks I started checking around and watching him on YouTube. I noticed on his trunks the names “Duke, Jr.” and “Jersey Joe”. “My dad was Duke who has since passed and being an admirer of the former heavyweight champion “Jersey” Joe Walcott is the reason for Jersey Joe,” said Hanks. Funny thing is, he reminded me of a young Timmy Witherspoon. Good jab, good movement for a big man. Through his agent/advisor Michael Borao I was able to contact Hanks though raised in Newark, NJ, is now living in L.A. I found him rather easy to talk to. Hanks is 6:04 and in his last fight in December came in at 249. I asked him why people claim he is a small heavyweight? “I don’t know why they say that for you can see by my last fight how much I weighed,” said Hanks. Brick City writer Danny Serratelli who has watched Hanks since the amateurs said, “He’s a really good kid. I have known Joe since we trained together at Gladiators Gym in NJ years ago when he was in the amateurs. The gym was unique because they had a good team of amateurs who pushed each other. Since that time it seems Joe’s professionalism and work ethic have paid off and I look forward to watching him make some noise in the heavyweight division as one of the top American prospects in 2012”. Hanks is 18-0 with 12 knockouts having turned professional in December of 2007 on a DiBella Entertainment card in the Bronx stopping Joe Rabotte in 2 rounds. In going over his record 8 of his first 15 opponents haven’t fought since his defeating them. In addition to this 2 of his 3 opponents in 2011 haven’t fought since either. One, Terrell “The Baby Bull” Nelson, 8-11, couldn’t come out for the fifth round back in April. After that, possibly Hanks biggest win was defeating Alfredo Escalera, Jr., 18-3-1, winning all 10 rounds on the judge’s scorecards. That was the first fight back east for Hanks since May of 2008. “I went from a 6 to a 10 rounder for the Escarlera fight and recently went down to NC to have a keep busy fight stopping Franklin Edmondson on December 3rd,” said Hanks. Next up will be in February 10th at the Mohegan Sun Csino, in Uncasville, CT. This will be another 10 rounder for Star Boxing with whom he had his first fight in April against Nelson. No opponent has been named yet by matchmaker Ron Katz. Hanks makes it clear “I am from Newark, NJ!” He moved to L.A. 3 years ago. His trainer from the start has been Jamal Abdulah. “I only had about 25 amateur bouts but have been sparring with professionals since my second amateur fight,” said Hanks. Speaking of sparring the list is a long one like former WBO title holder Sultan Ibragimov, Jamal McCline, Larry Donald Malik Scott, Cedric Boswell, former IBF Cruiser champ Al “Ice” Cole, Faruq Saleem, former IBO champ Siarhei Liakhovich and the before mentioned Byrd. “I sparred with Saleem (last fight in 2009 at 38-1) having only 2 amateur fights. We are both from Newark. Also Al Cole helped me a lot in the beginning. I only had 6 amateur fights when I sparred with Wladimir Klitschko,” said Hanks. 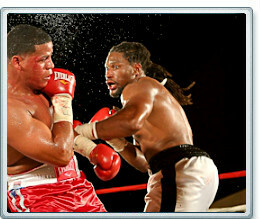 Hanks first big win was in his ninth fight over Ashanti “The Boss” Jordan, who was 10-0. “I lost to him in the amateurs so it was a feeling to beat him in the pro ranks” said Hanks. That was in August of 2009 and Jordan has not fought since. That is saying a lot for Jordan was one of the top prospects in the country at the time. In just Hanks fourth fight he was the first to stop Leo Bercier, 5-7-1, who would go onto defeat Andres Taylor, then 8-0-1. The referee rescued Bercier after taking 9 straight punches from Hanks without return in the first round. Hanks stopped Alvaro Morales, 3-3-5, in the first round in March of 2009. “Morales had a draw with Seth Mitchell,” said Hanks. Mitchell is currently 24-0-1. Wins over John Clark, 14-14-1 in October of 2009 by decision in 6 and knocking out Mike Tyson look-a-like Cliff Couser, 26-20-2 in the first round in February of 2010 put both of them on the inactive list since. Defeating Hildo Silva, 4-0-2 and Anthony Gatt, 7-1-1, proved he wasn’t beating up on bad record fighters. “I took the Gatt fight 5 days after knocking out Marcus Dickerson, (4-2-2),” said Hanks. The Gatt win was followed by a 6 round decision over Johnnie White, 22-2. That followed by stopping the “Tongan Warrior” Villi Bloomfield, 9-5-1, in 4 rounds. I asked Hanks about his Samoan War chant. He laughed saying “I have Samoan friends who chant as I enter the ring in CA. Beating a Tongan like Bloomfield made them happy and they made me an honorary Samoan”. Of the 18 fights Hanks has had, 12 of them have been in CA. Only since signing with Star has he come back east for his last 3 fights after having his first 3 in the east when turning pro. Hanks gave credit to his brother James who got him back into boxing. Both brothers are electricians. He also proclaimed that “I hope to be the heavyweight champion from right here in America, God willing,” said Hanks. Hanks has sparred many rounds with many of the top heavyweights in the world. He has the kind of work ethic that can take him to the top. Conditioning is a key in the heavyweight division today so don’t be surprised if Joe “The Future” Hanks is someday announced as the new heavyweight champion of the world “Jersey” Joe Hanks!